Carpet - G & L Building Services, Inc. If you are in the Charlotte, NC area and have found yourself with not-so-clean carpet, then you have landed at the right place for carpet cleaning services. It is a simple fact of life: carpets get dirty. No matter how hard we may try, dirt will always manage to get mingled into the fibers of our lovely carpet. Enter the carpet cleaning services provided by G & L Building Services, Inc.
We pre-treat your carpet with a powerful but carpet friendly chemical mixed with very hot water in order to break down the dirt and stain compounds that have formed in your carpet. We then use a carpet brush to work in the carpet cleaning chemicals and agitate the already loosened dirt and grime in your carpet. Any stains that will potentially be tough to extract will be hit with special chemical solutions and a plastic carpet scrubber. 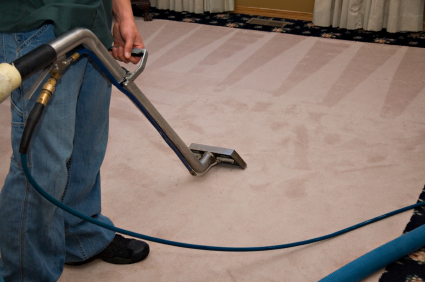 We tackle your carpet with our steam extraction wand in order to remove all the dirt and stain buildup. Any stains that remain will be worked on again with our chemicals and plastic carpet scrubber. We then extract those stained areas a few more times in order to remove the stain(s) as best as possible. With this 6 step system, your carpet will emerge refreshed and clean. No matter how dirty the carpet, we will always strive to make you satisfied with our carpet cleaning services. Do you need your carpets cleaned? Be sure to contact us via our contact page in order to request a quote or more information about our services.